Google has recently sent an email which informed me that "Blogger has been notified, according to the terms of the Digital Millennium Copyright Act (DMCA), that certain content in your blog is alleged to infringe upon the copyrights of others. As a result, we have reset the post(s) to 'draft' status." Apparently, this is the infringing post: http://googlesystem.blogspot.com/2008/02/lyrics-for-youtube-music-videos.html (Google Cache). 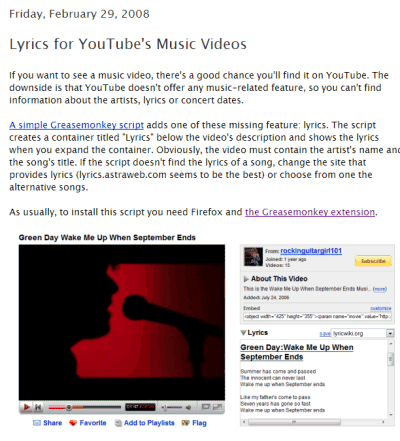 It's a post about a Greasemonkey script that allowed you to show music lyrics in the YouTube interface. I was curios to read the DMCA complaint, but Google doesn't send it. Instead, it uploads the document to ChillingEffects and suggests to use this page to find it. Unfortunately, the ChillingEffects search feature doesn't work, so you have to use Google's site operator to search for [site:chillingeffects.org domainname.com]. I've managed to find the DMCA notice: "The URL listed below is one of nearly 20 song lyrics sites who have attempted to post lyrics for the song titled 'Alden Howell' by the artist Inspection 12. The lyrics posted on this and other sites are not accurate and the artist has not given them permission to post lyrical content. Inspection 12 has been making efforts to contact these websites directly in order to have the content removed. We are attempting to have this URL and others like it to be excluded from google search results for the name 'Alden Howell'." Unfortunately for Inspection 12, that blog post doesn't include their lyrics. In fact, it only includes a screenshot with lyrics from a much more popular punk band. Inspection 12 has never contacted me and no post from this blog mentions 'Alden Howell' (except for this post, obviously). Google has a counter-notification form. "The administrator of an affected site or the provider of affected content may make a counter notification pursuant to sections 512(g)(2) and (3) of the Digital Millennium Copyright Act or other applicable law. When we receive a counter notification, we may reinstate the material in question," mentions Google. Update: Part 2, Part 3 and Part 4. Does blogger let you appeal these types of claims the way YouTube does? It will be interesting to hear the end of this story. Sounds like and opportunity to "takedown" Inspection 12... Let's have a run at that. When Did You Create Your Gmail Account? PayPal, Payment Method in Google Play? How Accurate Is Browser Market Share Data?